The concert was held amid tight security at the heavily protected Intercontinental Hotel. It was a rare music concert in the city. Kabul has witnessed a series of suicide attacks and explosions in the past few months. Saturday evening's concert was originally scheduled to be held in Ghazi stadium to mark the country's Independence Day. More than 3,000 tickets were sold at premium rates. But the authorities said they could not guarantee security at that venue. Ms Sayeed did not give up. She went ahead with her performance, but at a different venue. "Despite the threats, I didn't think such a big number of girls would attend here. Fortunately, the number of women is bigger than men," said Bahar Sohaili, who attended the concert..
"I asked some of the girls: 'Why you are here?' They told me they were here to defy those who were against the concert." 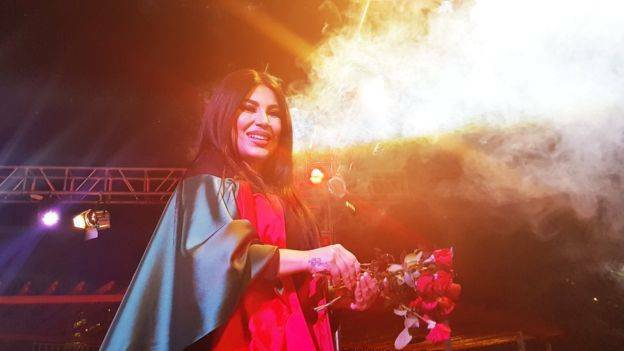 Ms Sayeed, described by her fans as Afghanistan's Kim Kardashian, is known for her long hair and figure-hugging outfits, which are seen as taboo by many in Afghanistan. Her music mixes traditional and folk songs rendered as pop. She sings both in Dari and Pashto, Afghanistan's two main languages. She said she was determined to go ahead with the concert, despite the threats. She has received a number of death threats from those who say her outfits and public shows are an affront to Afghan culture. "There are certain people in Afghanistan who have been against music, against celebration, against even New Year, Eid and everything. I feel like today we need to stand together and fight against it," said Ms Sayeed. "At the end of the day, we are also human beings and these are basic human needs - music, celebration, Independence Day, New Year." 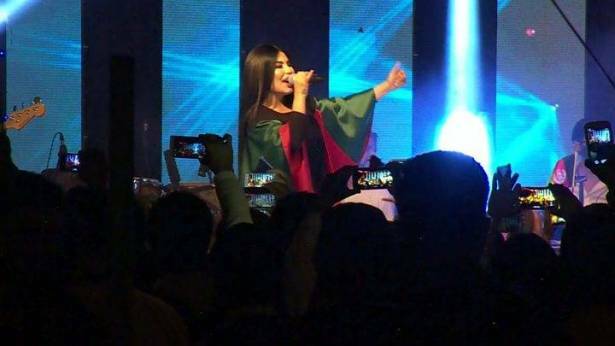 Ms Sayeed said she would donate the proceeds from the concert to the families of those killed by Islamist militants in an attack on the village of Mirza Olong in northern Sar-e-Pul province.